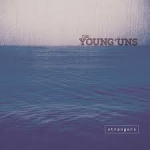 Share the post "Album review: THE YOUNG ‘UNS – Strangers"
Teeside three piece the Young ‘Uns – Sean Cooney, David Eagle and Michael Hughes – have won the BBC Folk Awards Best Group in 2015 and 2016, along with picking up numerous plaudits from the music press and many live appearances, making them one of the rising stars on the folk scene. Their harmonies and acapella singing is spot on, as can be heard on the opening two songs, their version of Maggie Holland’s ‘A Place Called England’ and ‘Ghafoor’s Bus’, about Teesise granddad Ghafoor Hussain who bought and converted a bus to go and feed refugees and migrants across Europe. The album’s theme is all about everyday folk and their extraordinary tales, all of which have a real resonance with what is going on in the world today. ‘Cable Street’ being a prime example, where the people of the East End of London joined with Jewish residents to block a march by the British Union of Fascists. The hero of the tale is based on Johnny Longstaff, who was sixteen at the time of Cable Street and went onto fight in the Spanish Civil War and the Second World War. The Young ‘Uns do use instruments to good effect on some songs, none more so than on the beautiful and moving ‘Dark Water’, where they are joined by Aldeburgh Young Musicians on strings and backing vocals, along with harpist Mary Ann Kennedy. Two other highlights are ‘Carriage 12′, about the heroes who took down a gunman on a train bound for Paris in 2015, and ‘Hartlepool Pedlar’, which features Michael Marks who later went onto to put the ‘Marks’ in ‘Marks & Spencer’! This entry was posted in ALBUM REVIEWS, ALBUM REVIEWS (Mobile), All Posts, The Best of 2017 and tagged acapella, album, BBC Folk Awards, folk, review, social history, Strangers, the Young 'Uns, vocal harmonies. Bookmark the permalink.